Cosesaurus turns out to be very close to the perfect ancestor to the Pterosauria, Sharovipteryx and Longisquama. Figure 1. Click to enlarge. Cosesaurus aviceps displaying its many pterosaurian characters. First described by Ellenberger and deVillalta (1974), Cosesaurus was viewed as a bird ancestor with its large eyes, beak-like snout, antorbital fenestra, strap-like scapula and other characters. It was considered a biped due to the anterior extension of its ilium. Unfortunately Ellenberger and deVillalta and later Elllenberger (1978, 1993) made several errors. They considered the coracoid a sternal keel. They considered the sternum a pair of enlarged and coosified coracoids. They considered a gastralium a retroverted pubis. They illustrated tail feathers. The mistakenly flipped the hand so digit 2 would be the longest, as in birds. Sanz and López-Martinez (1984) dismissed all of the traits that earlier workers had used to link Cosesaurus to birds, and relegated it to a juvenile Macrocnemus. Unfortunately their cartoonish reconstruction appears to have echoed their cursory examination because they ignored all the characters (discussed below) that no Macrocnemus has. Nevertheless, Sanz and López-Martinez were closer to the phylogenetic mark than Ellenberger was. Cosesaurus was a sister to Macrocnemus. 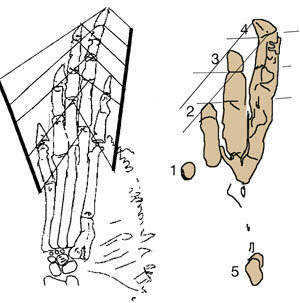 Peters (2000) examined Cosesaurus and saw the pterosaur connection in pedal 5.1, the elongated ilium, fused pubis and ischium, sacrum of 4 vertebrae, and other characters. As a novice, I followed Ellenberger (1978, 1993) with regard to the sternal keel and giant fused coracoids. As a houseguest of Ellenberger, I proposed a pterosaur hypothesis shortly after I had seen the specimen, but he dismissed the notion. In his PhD dissertation, Senter (2003) illustrated Cosesaurus with an antorbital fenestra, but described and scored it without one. He considered two curved coracoid stems (see below) to be displaced clavicles on a cartoonish drawing of the specimen and otherwise also overlooked what later detailed work (see below) would reveal. A second look at Cosesaurus and its apparent autapomorphies (= unique traits) revealed several mistakes in earlier reconstructions. That “giant co-ossified coracoid” was a sternum, but not just any sternum. In lizards, the sternum is typically located at the posterior tip of the interclavicle, but this sternum had migrated dorsal to the interclavicle, sharing an anterior border that pressed against transversely oriented and overlapping clavicles. That was a proto-sternal complex. Only fenestrasaurs, including pterosaurs had this trait. Moreover, this sternum has a posterior embayment that only fenestrasaurs had. Figure 2. Click for rollover image. Colorized sternal complex elements in Cosesaurus. Coracoids in blue. Scapulae in green. Clavicles in pink. Interclavicle in red. Sternum in yellow. That “sternal keel” and “curved clavicle” turned out to be a quadrant-shaped coracoid. Such a shape reduces the ability of the coracoid to contribute to glenoid movement during quadrupedal locomotion. Socketed by its ventral stem, such a coracoid is used to brace a flapping forelimb in birds and pterosaurs. The fenestrated coracoid of lizards like Huehuecuetzpalli evolves into the quadrant-shaped coracoid of Cosesaurus by enlargement of those fenestrations to the posterior rim of the coracoid. Taking the opposite tack, Macrocnemus reverted to a disc-like coracoid without fenestrations. Figure 3. Prepubes in Cosesaurus, In situ and reconstructed. That stem-like anterior process on the anterior process of the ilium turned out to be a displaced prepubis. The other prepubis was found partially hidden by a femur. Ellenberger (1978, 1993) was correct in his identification of the strap-like scapulae. 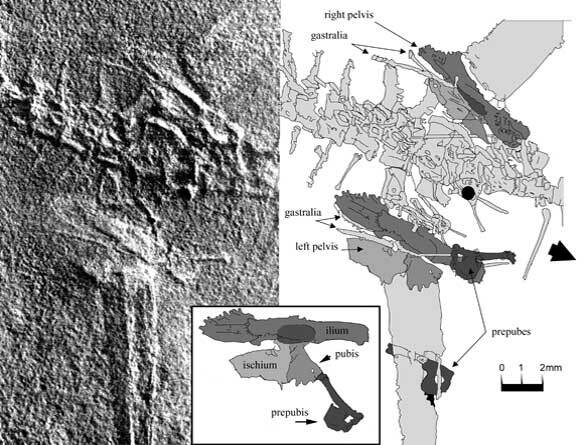 A pteroid and preaxial carpal were found (Peters 2009) and these migrated bones matched the shapes of the two centralia in Sphenodon. The entire manus of Cosesaurus was a close match to that of the basal lizard, Huehuecuetzpalli (Peters 2009). The divisions between feathers envisioned by Ellenberger (1978, 1993) are identified as regularly spaced pycnofibres (= ptero hairs). Figure 4. Click to enlarge. Cosesaurus and Rotodactylus, a perfect match. Elevate the proximal phalanges along with the metatarsus, bend back digit 5 and Cosesaurus (left) fits perfectly into Rotodactylus (right). Peters (2000a, b; 2011) reported that the feet of Cosesaurus could be matched to the unique tracks of Rotodactylus with digit 5 impressing far behind the others and the proximal phalanges elevated. Rotodactylus tracks were narrow-grade, digitigrade and occasionally bipedal, affirming Ellenberger’s (1978, 1993) estimations of Cosesaurus based on overall proportions. Cladistic anlaysis recovers a tree in which Cosesaurus follows Huehuecuetzpalli, Jesairosaurus and Macrocnemus before it precedes Sharovipteryx, Longisquama and pterosaurs. Surprisingly using only a quarter of its available characters (after all the one and only specimen of Cosesaurus is complete and articulated!) Hone and Benton (2007, 2008) nested this basal fenestrasaur as a sister to Proterosuchus, which it in no way resembles. Disrespected and ignored by virtually all paleontologists, Cosesaurus aviceps needs to be elevated to its rightful place in the panoply of important transitional taxa, as the “Archaeopteryx” of the Pterosauria. That’s the heretical view. Ellenberger P and de Villalta JF 1974. Sur la presence d’un ancêtre probable des oiseaux dans le Muschelkalk supérieure de Catalogne (Espagne). Note preliminaire. Acta Geologica Hispanica 9, 162-168. Ellenberger P 1978. L’Origine des Oiseaux. Historique et méthodes nouvelles. Les problémes des Archaeornithes. La venue au jour de Cosesaurus aviceps (Muschelkalk supérieur) in Aspects Modernes des Recherches sur l’Evolution. In Bons, J. (ed.) Compt Ren. Coll. Montpellier12-16 Sept. 1977. Vol. 1. Montpellier, Mém. Trav. Ecole Prat. Hautes Etudes, De l’Institut de Montpellier 4: 89-117. Ellenberger P 1993. Cosesaurus aviceps . Vertébré aviforme du Trias Moyen de Catalogne. Étude descriptive et comparative. Mémoire Avec le concours de l’École Pratique des Hautes Etudes. Laboratorie de Paléontologie des Vertébrés. Univ. Sci. Tech. Languedoc, Montpellier (France). Pp. 1-664. Peters D 2000a. Description and Interpretation of Interphalangeal Lines in Tetrapods. Ichnos 7:11-41. Peabody FE 1948. Reptile and amphibian trackways from the Lower Triassic Moenkopi formation of Arizona and Utah. University of California Publications, Bulletin of the Department of Geological Sciences 27: 295-468. Peters D 2000a. A Redescription of Four Prolacertiform Genera and Implications for Pterosaur Phylogenesis. Rivista Italiana di Paleontologia e Stratigrafia 106:293–336. Peters D 2000b. A Redescription of Four Prolacertiform Genera and Implications for Pterosaur Phylogenesis. Rivista Italiana di Paleontologia e Stratigrafia 106 (3): 293–336. Peters D 2009. A reinterpretation of pteroid articulation in pterosaurs. Journal of Vertebrate Paleontology 29: 1327-1330. Peters D 2011. A catalog of pterosaur pedes for trackmaker identification. Ichnos 18(2): 114-141. Sanz JL and López-Martinez N 1984. The prolacertid lepidosaurian Cosesaurus avicepsEllenberger & Villalta, a claimed ‘protoavian’ from the Middle Triassic of Spain. Géobios 17: 747-753. Senter P 2003. Taxon Sampling Artifacts and the Phylogenetic Position of Aves. PhD dissertation. Northern Illinois University, DeKalb, IL, 1-279. This entry was posted in evolution, pterosaur evolution, pterosaur origins, reptile family tree and tagged pterosaur evolution, pterosaur origins, reptile family tree, transitional taxa by davidpeters1954. Bookmark the permalink. Hi, I was wondering if you were aware of Franco Saller’s doctorate thesis, which heavily discusses Macrocnemus, Langobardisaurus, Tanystropheus, and Cosesaurus. Close-up photographs are also provided, and though the document is in Italian, google translate can help.